No, come back! It's not going to be gruesome or morbid. It might be a bit sad, but I hope it'll be interesting. 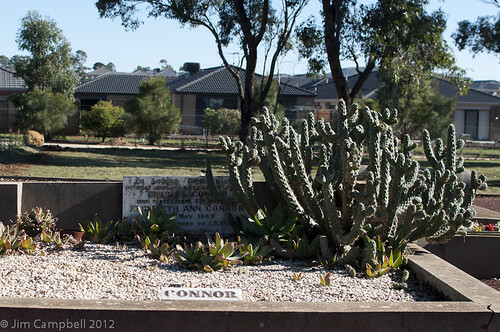 The other day I took a little walk up to Maddingley General Cemetery, which is not too far from my place. I put the link to the map because Google will tell you that the cemetery is in the middle of town! That is a shop, an optician from memory, which is also the registered office of the cemetery's trustees. Anyhoo. I put together some gear and went for a stroll on an usually sunny late May morning. Nikon D90 - gotta have a camera for this sort of thing! Nikkor 35mm f/1.8 lens - given the crop sensor on the D90, this is my 'nifty fifty'. Orbis Ringflash adapter - great for macro work. I didn't take a bag, just slung the Orbis on my shoulder, Tamron 60mm in one pocket of my shooting vest (yes, shooting vest. Don't judge me), flash in the other and off I went. 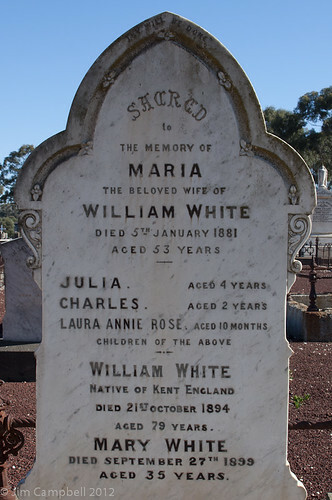 When I got there, it looked just like your average small country town's general cemetery, with different sections for Catholics and Protestants. I didn't see any sections for non-Christians though. I don't know if the cemetery is still in use. I didn't see any fresh plots, but the latest dates I noticed were only from last year so it probably is. There's certainly plenty of spare space. I had a look around some of the more modern areas. 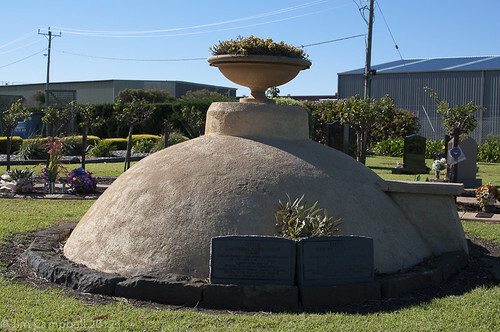 There are some large mausoleum-type burials, mostly with Italian and some Greek names representing Bacchus Marsh's more recent history as a market gardening centre. 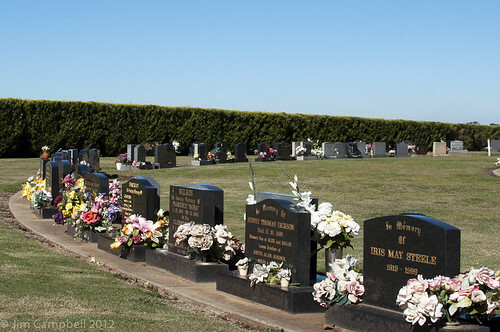 Most of the 'recent' burials looked to be well tended and most had full grave layouts and marble or granite headstones. This one was a bit more on the 'budget' side. I had actually thought that this was just a temporary placeholder while the monumental masons were making up the actual headstone, but the date of death is from 1986, so I guess not. Another nearby grave was not quite so well tended. Maybe the Connors were just a prickly bunch. Then I made my way back to the older area where there are burials from the pioneer days. Now we're getting interesting! 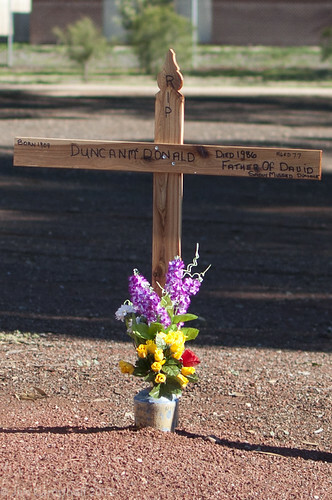 Some of the burials were not tended at all and had no headstones or other markers. 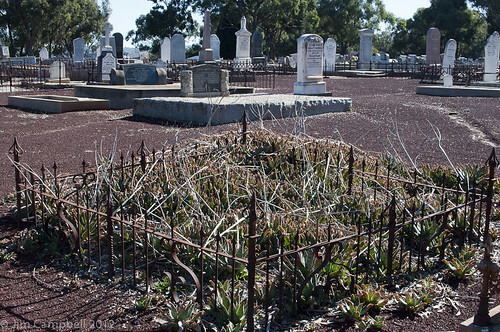 Where there were markers, the thing that stands out is how many children died very young in the late 1800s. Life must have been tough for those early pioneering types. Even if you made it through childhood, you weren't guaranteed a long life. Poor Nellie was only 18 but I imagine that in the late 1800s she'd have been "husband high" and living her own life. 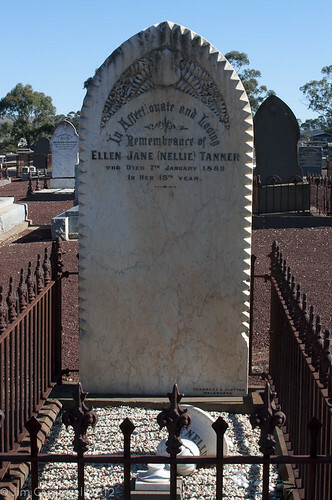 Sadly, her grave marker shows no indication of a husband, nor does is say who erected the stone for her. There is a large area of blank space as if there would be other burials in the same plot, but there the story ends. Here's an interesting one. 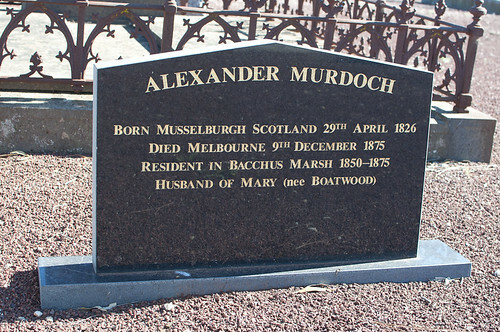 Alexander Murdoch, an immigrant from Scotland like me, seems to have been remembered quite recently. He has a very modern headstone compared to the others who died in the nineteenth century. Another family who lost young children were the Andersons. This one, though, stood out for me because of Mr Anderson's unusual middle name. 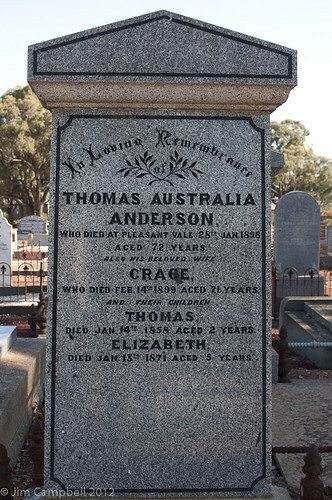 He would have been born around 1826; I wonder if he was born here. 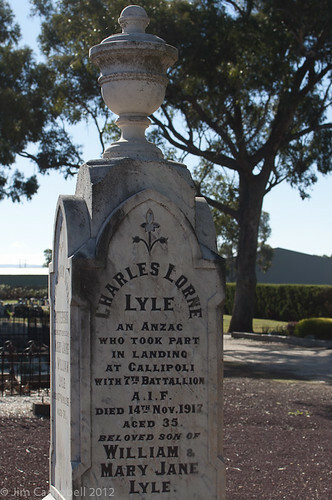 Moving into the 20th century, we find the a grave marker, the side of which commemorates Charles Lyle who died 2½ years after he took part in the landing at Gallipoli. Did he make it home from the war or is this a memorial marker? I don't know, but I salute him. As I headed out of the older section of the cemetery, I discovered that some people had apparently chosen to be interred in what looks like a wood-fired pizza oven! I have no idea of the significance of this monument. If you know, please tell me in the comments. One last look back at the more modern area. I believe these are headstones marking cremations. I like the tension between the curve of the line of markers and the straight line of the boundary hedge. 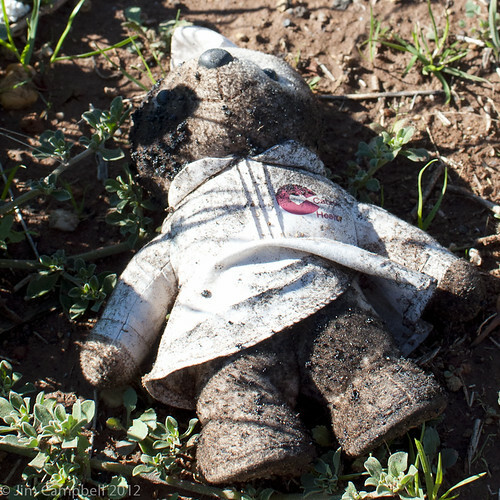 An interesting postscript: As I was leaving, just outside the cemetery fence I found a little teddy bear lying in the grass. He was all mildewed and mouldy and covered in dirt, but he was wearing a white coat with some sort of health provider's logo. 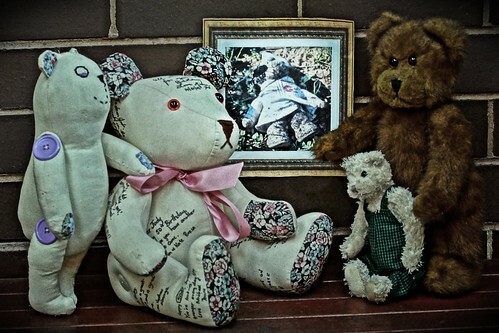 Perhaps he was a comfort bear given to a small child at a hospital or hospice. I wonder if the loss of the bear caused more tears than attending a funeral may have caused for this hypothetical child. We shall probably never know. My friend Allan Saw (Flickr, Twitter) was moved by the fate of this poor teddy bear and used his wonderful photographic and post production skills to create this image of a Teddy Bear Wake. I think that the concept of the wake, even the funeral, are important. Not for the dead, but for the living. It is necessary for the living to grieve, to celebrate the life of the dead person so that they can move on with their own lives. I'd appreciate your thoughts on life, death and photography in the comments. I had viewed your photos on flickr earlier in the week but only fleetingly. I have enjoyed your written journey through the cemetery and the teddy bear wake too which I also missed this week. Definitely working too much if Im missing classics like this. I agree- much nicer that these days a funeral & wake are seen as a celebration of life. And as long as the departed remain in the memories of the living then they live on. Cemeteries are fascinating places providing glimpses into lives long and short, happy and tragic, though I admit Ive never thought to take my camera with me to one.. perhaps one of these days ...when I go a wandering. Wow! Thanks for taking the time to comment, I'm glad you enjoyed my little cemetery tour. I must do this more often! A lovely set of images and story Jim. I've always tried to live by the thought: Rather than despair that they have gone, celebrate that they have been (a part of your life). As one reaches a 'certain age', one tends to attend more wakes than weddings, more cremations than christenings. One learns to deal with it, I suppose.